Same price, no lines, FREE delivery! That's Black Tie Delivery Ski and Snowboard Rentals! No longer do you have to line up with the masses clambering for lousy rental poles out of a bin. Black Tie's professional and friendly certified ski and snowboard rental technicians will custom fit each piece of equipment to your individual needs at a time and place convenient to you. At Black Tie Delivery Ski Rentals we feature award-winning customer delivery service, the best equipment from the top brands, attentive slope-side assistance, and quite simply a better way to rent ski and snowboard equipment. We carry Atomic skis and snowboards; Blizzard skis; Dynastar skis; Nordica skis; K2 skis and snowboards; Ride snowboards; Leki poles; and Tecnica, Nordica, Dalbello ski boots; and others. We are often less expensive than even standard ski rental shops and offer packages as low as $24.00 per day. Black Tie Delivery Ski Rentals of Park City, Utah, is the premier ski and snowboard delivery provider in Park City, Deer Valley, and The Canyons. You no longer have to line up with the masses clambering for lousy rental poles out of a bin! Black Tie is 100% focused on ski rental delivery. Just imagine our award-winning rental technicians personally tailoring the best equipment to your individual needs at a time and place that is convenient to you. We are a full-service mobile ski shop with goggles, socks, gloves, and all the other items you'll need on any ski vacation. All this for LESS than most standard ski shops! Black Tie Delivery ski and snowboard rentals serves Park City Mountain Resort, Deer Valley, The Canyons, and the surrounding Park City, Utah area. Black Tie Delivery Ski Rentals of Park City Facebook: Park City, Deer Valley, and The Canyons' premier ski rental delivery company. Help us celebrate 10 great years with our Facebook photo contest. Click through for details. Last updated on 03/20/2014. Always call for latest pricing. Atomic skis, Atomic snowboards, Dalbello ski boots, Dynastar skis, Head skis, K2 skis, K2 snowboards, Look bindings, Nordica skis and ski boots, Ride snowboards, Roxy skis, Stockli skis, Tecnica ski boots, Volkl skis, The Canyons lift tickets, Park City Mountain Resort, Deer Valley, Utah. Black Tie Delivery Ski Rentals features the best gear from the premier providers in the industry. We carry women's and men's specific skis as well as Junior Performance skis and premium boots that provide better performance and COMFORT! We also offer more basic, lower-priced standard skis. Black Tie is proud to offer discounted lift tickets to Park City area resorts, including The Canyons, during your fitting process! Award-winning customer service combined with slope-side support and all your ski and snowboard rental needs delivered to the comfort of your own lodging in Park City, Deer valley, and The Canyons, Utah. All of our professional rental technicians are Atomic, Marker, Rossignol/Look/Dynastar/Roxy, and Tyrolia/Head certified. 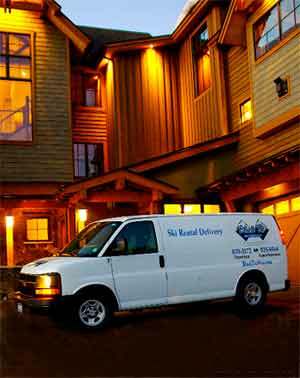 Black Tie Delivery Ski Rentals of Park City services Deer Valley, The Canyons, and Park City. We are located WHEREVER YOU ARE! We're just a phone call away!